Photoshop actions are really cool automatic adjustments that allow you to easily enhance your photographs with the click of a button! They are created by photographers/artists for editing your photos with ease from within Adobe Photoshop, similar to something like say, Instagram filters, but with far more intelligence and customizability. 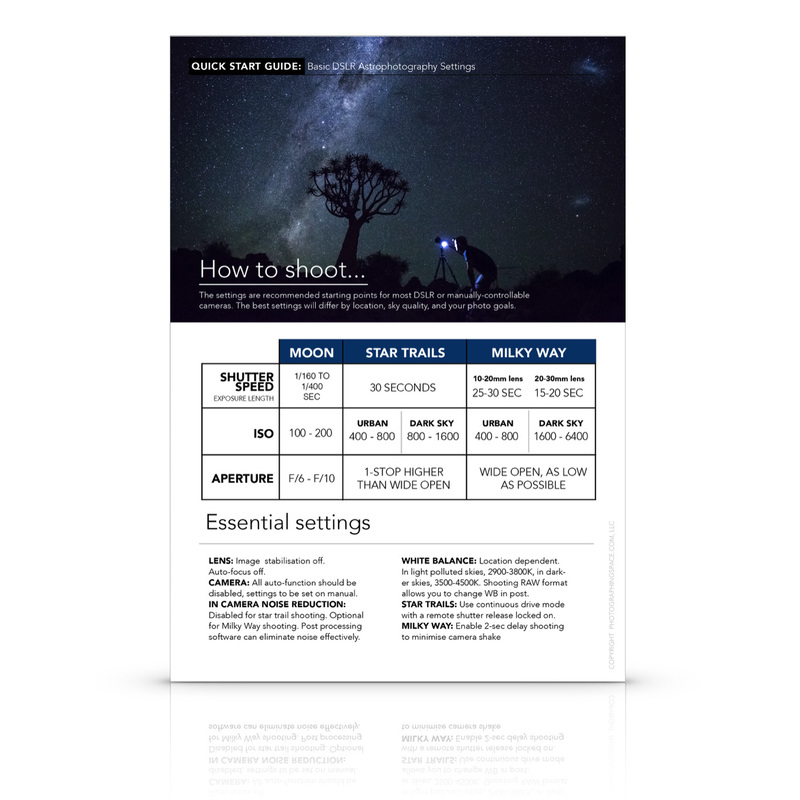 The best part is that our Photoshop action packs have been designed specifically for astrophotography! How do I download the Photoshop action packs I’ve purchased? Upon completion of a successful purchase (thanks, you’re AWESOME! ), you should have been emailed a special download link JUST FOR YOU! Simply click this link and you will be able to download a .zip file that includes the files necessary for using your awesome Photoshop action pack(s). You should also have been supplied with a download link as you checked out. IF (nooooo!!!) something went haywire with your download or you can’t find your download email (check your GMail “promotions” and SPAM folder), just let us know and we’ll help you out. Contact us here! How do I install my Photoshop action packs? Installing our Photoshop action packs is super simple. Double-click the .atn file to open it in Photoshop. 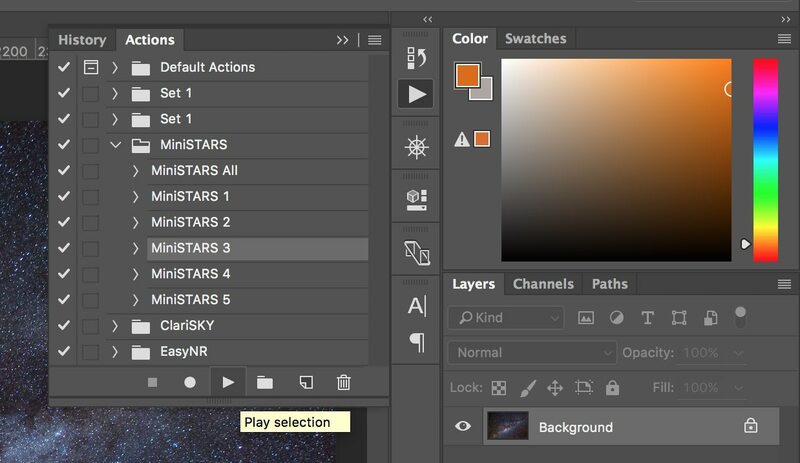 How do I use my shiny new Photoshop actions? Open the actions panel in Photoshop, the triangle “play” button, usually on the upper right. Find the action pack folder (group) in the list and expand it. Select the image layer (in the Layers pane) that you want to apply the action to. Select the action name you want to run (in the Actions pane). For example, click the word MiniSTARS 1, (not the open box to the left of it). Click the triangle “play” button at the bottom of the action panel to run it on the currently selected layer. What operating systems will my Photoshop actions work on? Photoshop actions will work fine with both Microsoft Windows (PC) and OS X (Mac), assuming you have a suitable version of Adobe Photoshop installed (see below). What versions of Photoshop will my Photoshop actions work with? Most of the Photoshop action packs available from on our site should work fine in Adobe Photoshop CS4, CS5, CS6, and Photoshop CC/Photoshop CC 2016. It is important to note that EasyNR requires Photoshop CC or later, due to the requirement for the camera raw filter. In the unlikely event that something is not working for you (nooooo!!! ), please just contact us and we’ll help you sort out any issues! Note that it is always highly recommended to use the latest version of Photoshop available! What license do I have with Photoshop action packs purchased from PhotographingSpace.com?